We are so excited to announce our new Single-origin coffee from Pachamama Coffee Cooperative, available only through the month of March. This rich, medium-roast blend comes from Santa Clara Laguna in southwestern Guatemala and has lovely notes of chocolate and hints of hazelnut. 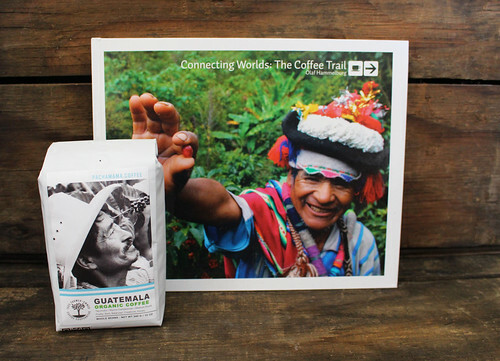 To commemorate the occasion, we are giving away a bag of organic Guatemala coffee and a copy of the book Connecting Worlds: The Coffee Trail by Olaf Hammelburg, which depicts the journey from farmer to consumer. 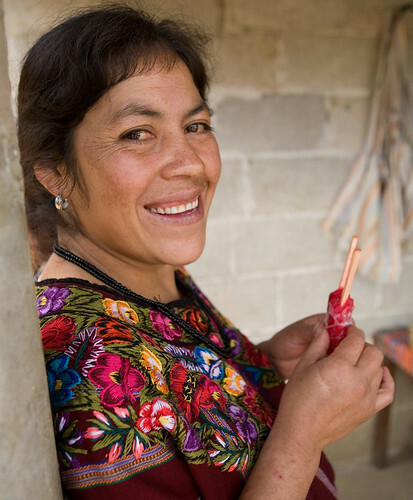 Pachamama Coffee Farmer Catarina Yac is a small-scale, organic farmer in Santa Clara Laguna in southwestern Guatemala. Arabica coffee production, sometimes referred to as “mountain coffee," is Catarina's primary source of income. As a single woman, she also produces a variety of crops for personal consumption and bartering between neighbors. The Yac Family is a member owner of the Manos Campesinas cooperative. Click here to learn more about Catarina’s unique journey. 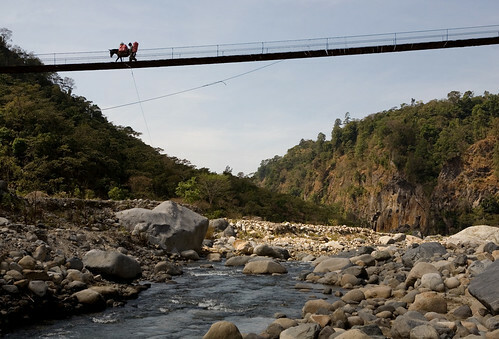 To win a copy of Connecting Worlds: The Coffee Trail and a bag of Pachamama’s single-origin organic Guatemalan coffee, simply leave a comment below answering this question by Thursday, March 19, 2015 (one entry per-person please). No purchase required. Limit one entry per person, please. Entries will close on Thursday, March 19, 2015 at Noon. Winners are chosen by Random Number Generator and announced on our blog on Thursday, March 19, 2015. Thank you for all the amazing and heart-warming comments! One thing is apparent, our customers love and appreciate their coffee. "Aroma filling the crisp morning air. Lowering the French press, after eagerly waiting for the dark and bold flavors to be released. Pouring it piping hot over raw cream and grass fed butter in my mug. Too hot to taste, so I am forced to close my eyes and breathe in the aromas. Small sips as I soak up the quite time for myself. To me, that is a great cup of coffee." Among the vast cornucopia of crops grown by farmers, there isn’t another quite like the Belgian endive (pronounced on-deev). 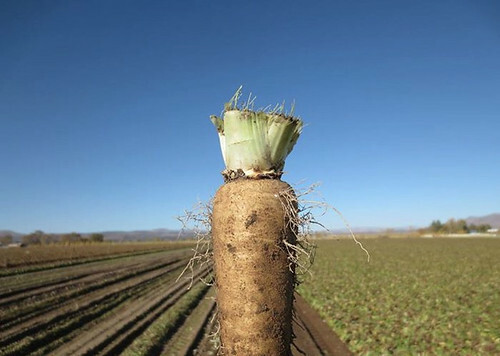 Known as one of the most difficult vegetables to grow, Belgian endives are a very special long season crop that requires a winter, indoor “forcing” phase to produce the tightly-wrapped, almond-shaped, cream colored heads that you find in your Farm Fresh To You box. While the first growth phase takes about 150 days in the field, where the chicory grows from seed into a leafy green plant with a deep tap root, we had the privilege to view the later and more mysterious part of the second-growth process. At harvest, tops of the leafy chicory plant are cut-off; the roots dug up and then placed in cold storage where they will enter a dormancy period. 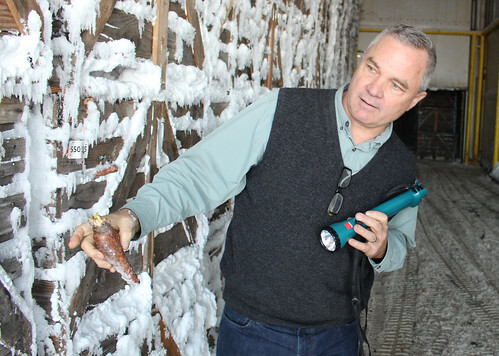 As demand necessitates, roots are removed from cold storage for their second growth, which takes 28 days in dark, cool, humid forcing rooms, similar to a mushroom growing facility. 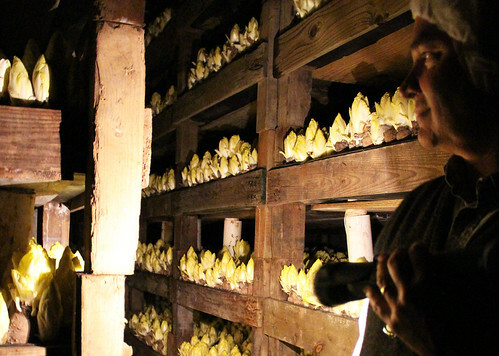 After that, you are left with a delectable harvest of Belgian endive, which are then packed into environmentally friendly Bagasse trays (a fiber made from sugarcane). If you haven’t tried one of these vegetable divas, I highly recommend that you do. The taste is unmistakable; it is naturally slightly bitter with a nutty finish. It is delicious raw or in salads, but also makes an excellent cooked vegetable that can be baked, roasted or braised. 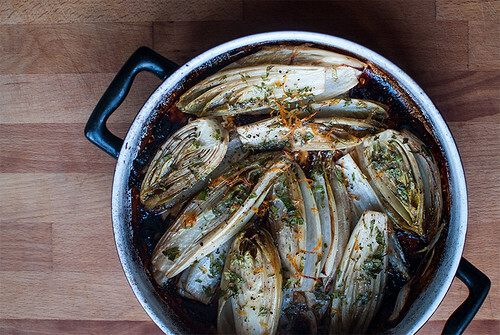 Our friends at California Endive are a great source for yummy endive recipes, but we suggest you try this scrumptious recipe for roasting endive that we think you will love. Cut endives in half, discard outer leaves. Melt butter in a large skillet, add endives and sauté over medium heat for about 5 minutes. Carefully turn endives over and sauté for another 5 minutes. Combine balsamic vinegar with maple syrup and orange juice, add salt. Arrange endives in a buttered baking dish. Pour over the sauce. Top with orange zest and fresh parsley. Bake at 400F for about 30 minutes - until endives have softened. Serve and enjoy! 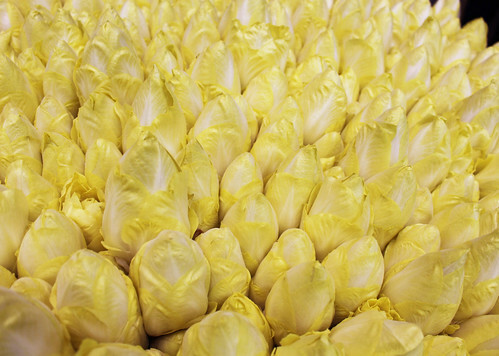 We hope this inspires you to try something new with your next delivery of endive – trust us, you will discover a whole new and delicious flavor profile.